At the beginning of what is still being called the “container revolution,” Red Hat expressed very vocal skepticism about the technology’s inherent security — at one point in 2014, suggesting Docker images should never be widely distributed, and relegated to the specific system in which they’re intended to run. But now that Red Hat is the company whose principal product is a platform for distributing and running containerized software, including its own middleware frameworks, the proverbial shoe, and its associated proverbial foot have clearly exchanged locations. To kick off the first day of Red Hat Summit Tuesday morning in Boston, and by way of launching the all-SaaS edition of its container platform, entitled OpenShift.io, Jim Whitehurst, the company’s president/CEO, told attendees that their organizations’ first priority should be to move all their applications — including their legacy apps — toward a truly portable, cloud-focused deployment model. This while comparing feedback from customers last year to this year, suggesting that security is a declining concern among organizations eager to move to cloud-native. Though he cited few hard numbers to back up his assertions, Whitehurst did say that some 84 percent of this year’s Red Hat customers told the company that they have some kind of cloud deployment strategy in place. And though he leveraged this vast majority figure as evidence that Red Hat should enable and encourage customer choice, that citation led to an assertion of what that choice should be: an expanded OpenShift platform. 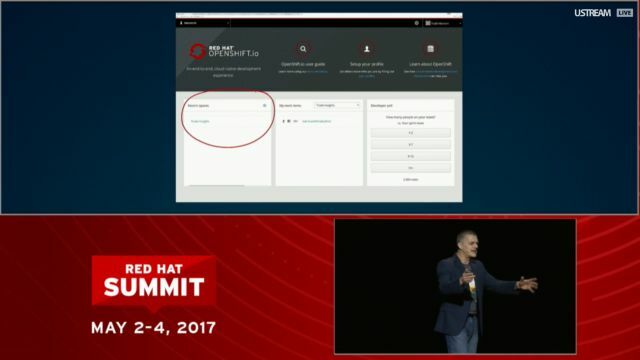 OpenShift.io, with the top-level domain attached, will be Red Hat’s new portal for developers and teams seeking to build and deploy applications immediately, without bringing any infrastructure of their own to the table first. 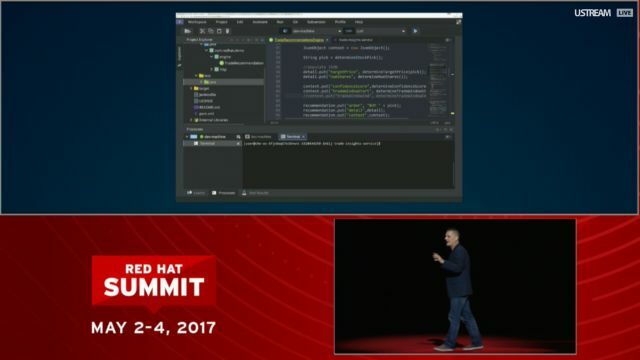 Lead development tools product manager Todd Mancini demonstrated OpenShift.io as a Web-based console from which the entire lifecycle of an application could be managed, from initiating the idea, through development, deployment, debugging, and re-iteration. In this era where Slack has already made considerable breakthroughs as a chat-driven collaboration platform, Mancini pitched OpenShift.io as a collaboration center that brings Red Hat tools and services — including the company’s new OpenShift Application Runtimes (RHOAR) for building microservices — closer to the developer without the use of Slack. “With just a browser and an Internet connection, a developer — in fact, a whole team — can get started instantly,” stated Mancini, without also referencing modems or CompuServe accounts. With a selection from RHOAR, Mancini went on to create the space for a Java app invoking the Vert.x framework, which is one of Red Hat’s methods for building distributed systems using a reactive model. He made a compelling point here by noting that such a model may typically require the developer’s attention to infrastructural detail, which is unnecessary in this instance since all the infrastructure is being managed by the SaaS host. Mancini’s demo followed an earlier peek at using RHOAR on OpenShift, hosted by a typical hybrid cloud platform. (The word “OpenStack” is being invoked less and less nowadays.) 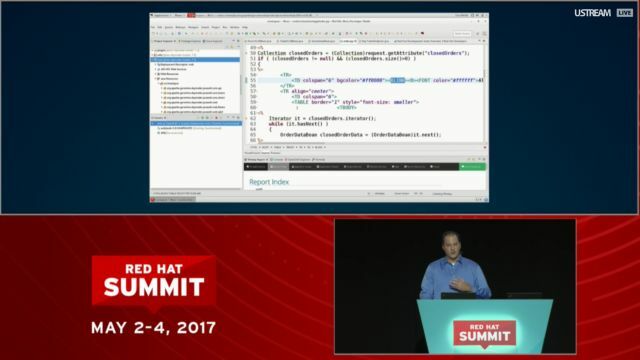 Red Hat Senior Application Technical Evangelist James Falkner showed Summit attendees how OpenShift addresses the issue of wrapping monolithic, legacy applications in container wrappers and deploys them instantly. The Red Hat Application Migration Toolkit needed for the task provides an analysis engine that looks at the source code of your application and determines what needs to be migrated, feeding that result to the Web reporting engine that shows the issues that it found for migration. Falkner’s demo showed how RHOAR components — the first of which were generally released a few weeks ago in OpenShift 3.5 — substitute for the middleware components commonly found in JBoss EAP applications. This way, legacy apps written around JBoss may be containerized, may communicate with containers fulfilling the middleware role, and also may be scaled up or down in a way their client/server counterparts could not possibly accomplish. Inevitably, Red Hat’s method will be compared against the new method which Docker’s then-CEO Ben Golub unveiled at DockerCon two weeks ago. There, Golub suggested most containerization of legacy applications could take place “without changing a single line of code.” Tuesday, Falkner showed a process which involved significantly greater interaction between the console and the developer, including making suggestions about what old code will still need to be changed and why. Red Hat revealed today it’s applying an analytics engine to assist in determining what source code can be tightened and which core components may be replaced with newer ones — including in the interests of that long-neglected concept, security. During a press conference from the Summit Tuesday afternoon, Red Hat officials revealed an expanded relationship with Amazon Web Services, which would enable RHOAR components to run on OpenShift in AWS, and in turn, which would enable some Amazon components to run on OpenShift platforms on customer premises. As Mike Ferris, Red Hat’s vice president for technical business development told the press gathered in Boston that this move effectively infuses OpenShift with Amazon ingredients — as he described it, “actually being able to bring the core Amazon Web Services capabilities into OpenShift, regardless of where the customer is running OpenShift.” AWS services such as Amazon’s RDS or Route 53 will be available directly within OpenShift. The implication here is that AWS services would continue to run in OpenShift platforms once those platforms were deployed on other hosts, including Azure and Google Cloud Platform. That seems extremely unlikely at this point, although Ferris’ choice of words did appear to specifically and intentionally leave that option open.